A timely memoir, reflecting on growing up post-9/11 in the intersection of gender and religion in the US. Amani reflects on her childhood, the prejudice she has faced, and continues to face as a Muslim woman. She also explores the media’s impact on public opinion, through both linking of Muslim identity to violent extremism and fetishizing hijabi women. At 134 pages A Coming of Age not much longer than an extended opinion piece, and indeed it reads like 3 long-form articles strung together. Given Amani’s journalist background this isn’t hugely surprising. When she is focused on topics and narratives she is comfortable with the prose shines. The commentary is insightful, complex and nuanced, acknowledging that her own experience is just part of a diverse whole, while highlighting the inequalities so deeply embedded in American (and global) society. The first 40 pages are not as compelling as the rest, but this should not put you off reading it in its entirety. 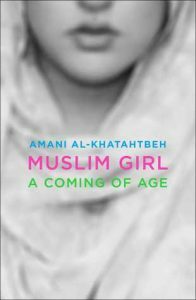 The first section focuses on Amani’s childhood, up until she decided aged 13 to wear a headscarf. That moment marks a turning point in both Amani’s life and in the book, as it moves from overly ‘neat’ anecdotes used to make a point, into the more layered analysis she excels at. The sections about the founding and initial development of the Muslim Girl platform are interesting. I loved the stories about building her friends up, supporting each-other and carving out a safe space for women to have open and respectful discussions about the things that really mattered to them. I wish there had been more focus on this, as it seemed to be taken for granted that anyone reading the book would be familiar with both the platform and Amani’s various high profile interviews and viral posts. The analysis of Laura Bush’s 2001 speech which called for the American people to join together in “working together to insure that dignity and opportunity will be secured for all the women and children of Afghanistan” is particularly interesting. Amani points out that Laura used the “Afghan women’s narrative to impose a violent solution that was not of their own choice or opinion” and which subjected them to war, harming them and their children disproportionately. This extension of Colonial narratives of liberation and civilisation is perpetuated by the media, and taken for granted or seen as progressive in many cases. Both a strength and a limitation of this book is its timeliness. By addressing very current issues it makes for interesting reading, breaking down topics such as; Brexit and Trump’s presidential campaign desire for a ‘Muslim ban’. Amani points out, rightly that “The tragic irony is that the wealth that the UK sought to protect with #Brexit was robbed from the home countries of many of its immigrants”. The unfortunate result of this focus on current event is that just 7 months after publication it is beginning to feel like something is missing. In that time Trump has been elected, a travel ban for Muslims (if not in words, at least in intent) has been put forward, and so many of the issues about media coverage of women in general and Muslim women in particular have been exacerbated. This is an important book, a time capsule of growing up as a Muslim woman in post-9/11 America, but it is Amani’s website Muslim Girl I will be look to for updates and insights as history unfolds around us all.